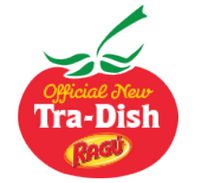 Disclosure: As part of the Ragú® #NewTraDish challenge, I will be compensated for my time in creating two unique recipes. However, all views shared are mine and mine alone. One of my passions beyond writing and my blog is cooking. I love getting in the kitchen and trying out new recipes, recreating family favorites, or turning recipes I have seen in magazines or online into more healthy versions for my family. But, when you have two young children like I do, your time is limited, and being in the kitchen by yourself is nearly impossible. While I love cooking with the girls and seeing the get excited about cooking and baking, I also would love "me time" to experiment and play around with different flavors and ingredients. So, when I was recently asked to take two popular Ragú® recipes using their Ragú® Old World Style® Traditional Sauce and create my own version or a new spin on the recipe, I jumped at the opportunity, as it would be give me an excuse to have to get in the kitchen...and have some fun. Out of the recipes available, I ended up choosing Mama's Easy Awesome Meat Sauce and the Upside-Down Deep Dish Pizza to put my own spin on. Our challenge was to . We were told we could turn the recipe we chose into a finger food instead, make it a sandwich, give it a Mexican or Asian or Southern flare, or create a new, totally unique presentation (e.g. Cheese Steak Sandwiches turns in to Cheese Steak Pizza or No Boiling Lasagna turns in to individual No Boiling Lasagna dishes in muffin tins, etc.). Knowing that I have many mommy followers with young children, who also find it hard to get into the kitchen especially come dinner time to whip up a healthy hearty meal, I wanted to make fun recipes that were not only delicious, but most importantly quick and easy to make. I come from an Italian background, and grew up having 2-3 pasta meals a week, usually Wednesday and Sundays (at my Nana's). When visiting my grandmother who was from Italy, she would make everything from scratch, from the homemade pasta sauce to the pasta and even mozzarella balls. Oh how I loved Sunday dinners, as you could really taste the different flavors of the foods, and knew that everything was homemade. While my mom knew how to make homemade pasta sauce, oftentimes she would find herself pressed for time and would reach for a jar of spaghetti sauce in the pantry. To add flavor to the sauce, she would add the sauce to ground hamburger and leftover veggies diced up like carrots, peppers, etc. Just by adding these additional ingredients she would be able to take a simple jar of pasta sauce and turn it into a flavorful sauce, that could pass for homemade. When I moved out on my own, I would oftentimes find myself stealing my mom's recipes and making a quick and easy pasta sauce with add-ins to serve with spaghetti, when friends came to visit. Loving to experiment, I would replace the ground hamburger with ground chicken, ground chicken and even sweet and spicy sausage. 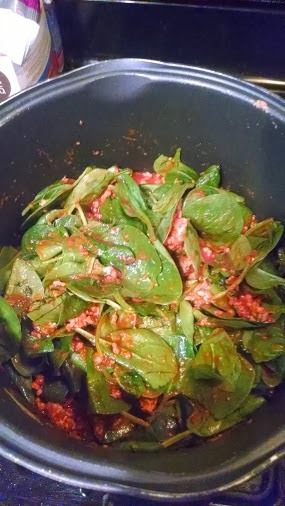 I would add things like kale, spinach, swiss card and other leafy greens to the sauce, to give it new flavor. Now, years later, I still continue to serve up my revamped pasta sauces using Ragú® Old World Style® Traditional Sauce as the base. Each jar of Ragú® Old World Style® Traditional Sauce is made with 11 juicy tomatoes making it its richest, thickest recipe. 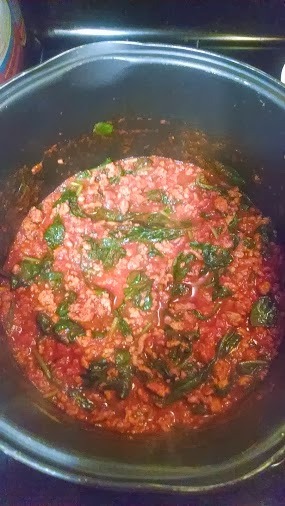 Here is my spin on Mama's Easy Awesome Meat Sauce from Ragú®. 1. Cook up ground turkey in large stock pot (if sticks in pan, add 1/2 tsp. of oil to prevent sticking). Once cooked through, drain and return ground turkey to pan. 2. 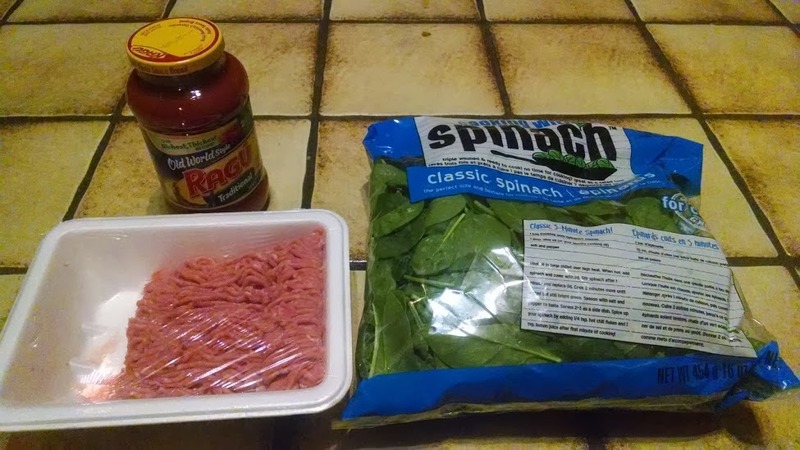 Add 2 1/2 cups fresh spinach and jar of Ragú® Old World Style® Traditional Sauce to pot. Stir to combine and bring to boil. 3. Once sauce begins to boil, reduce heat to low and cover with lid. Continue to cook until spinach begins to wilt. Cook for 3-5 minutes until all spinach is wilted. 4. Serve prepared sauce over pasta of your choice. Sprinkle with ground Pecorino or Parmesan cheese and enjoy! 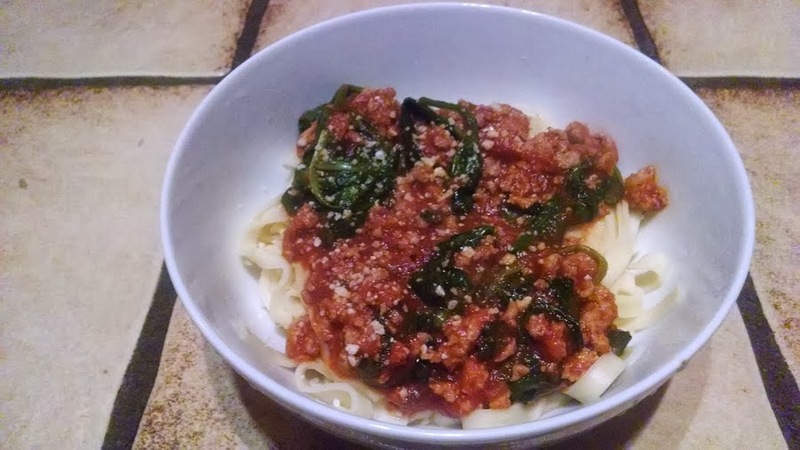 Want more recipe ideas using Ragú Pasta Sauce? Then, visit www.Facebook.com/RaguSauce for additional quick, easy and delicious recipe ideas. Head on over to www.RaguSweeps.com to enter the Ragú Better and Better Sweepstakes for a chance to win great Authentic Italian themed prizes and a grand prize trip to Venice for a family of four. Good luck! This sounds like one I would really love to try. I too love italian food it is my overall favorite. I really like spinach too so this is a must try. I also think that it is wonderful that I can buy all of these ingredients and a loaf of bread for only $10.00 thanks so much for sharing this recipe.